The Seuru Project includes over 50,000 hectares of exploration reservations, including some exploration permits, in the Central Lapland Greenstone Belt of northern Finland. The Seuru Properties include a large portion of the Kittilä Group rocks, which are the same rocks that host Agnico Eagle’s Kittilä Mine (Suurikuusikko), the largest primary gold producer in Europe. The Kittilä mine property is directly adjacent to part of the Seuru group of properties. FireFox cautions that proximity to a discovery, past-producing mine, or mineral resource, does not indicate that mineralization will occur on FireFox’s property, and if mineralization does occur, that it will occur in sufficient quantity or grade that would result in an economic extraction scenario. Sarvilehto: The Sarvilehto target exhibits excellent gold potential in recent studies by the GTK (2009-2010). 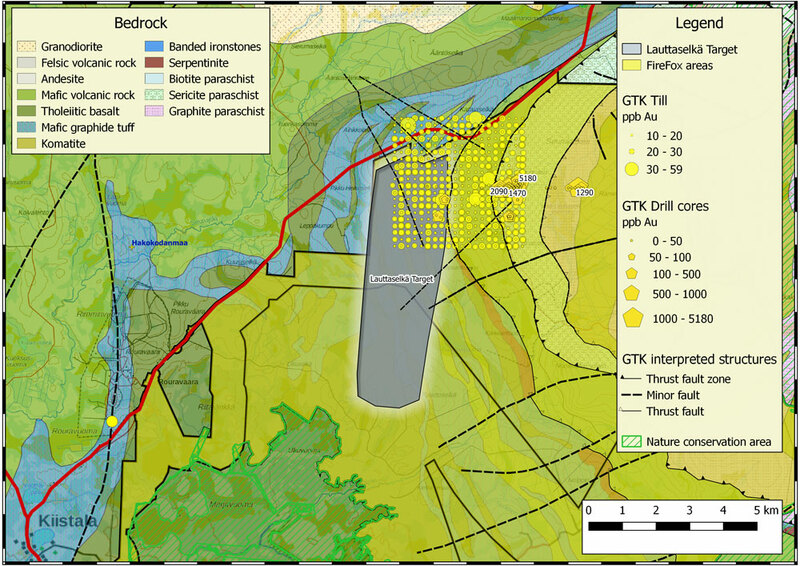 GTK drill results from 2009 intersected up to 3.57 g/t Au over 0.45 m (U441/2009/R8)4. Micro panning of a 10kg heavy mineral sample revealed 118 gold micronuggets resulting in anomalous Au and As - a clear indication of the gold prospectivity of the area. Assays from percussion till samples (GTK & recent FireFox) indicate enrichment of pathfinder elements such as Bi and As. Lauttaselkä: The Lauttaselkä target lies in the same suite of volcanic rocks that host Agnico Eagle’s Kittilä Mine, less than 10 km away.The geology at the area is favourable for orogenic gold deposits. Several target areas: Structural intersections coincide with gold and trace element geochemical anomalies from GTK historic geophysical surveys, till geochemistry, and drilling results. 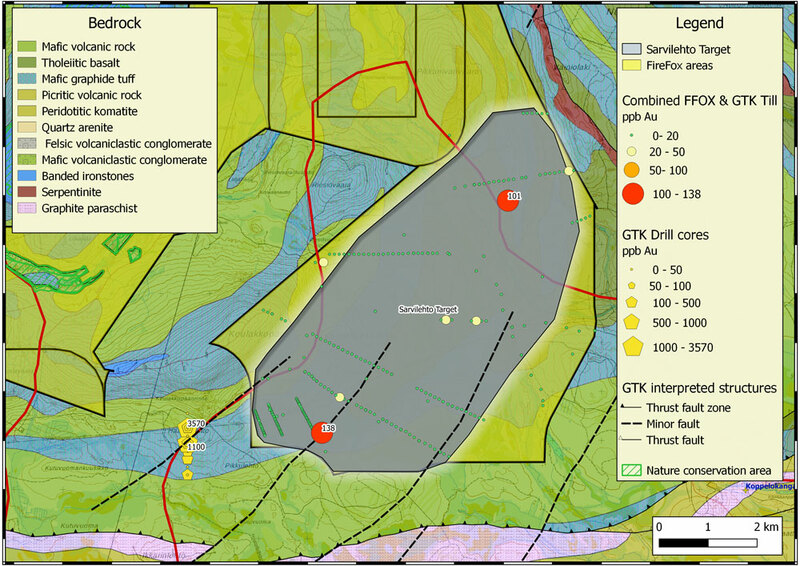 FireFox is conducting systematic exploration work at Seuru in 2019, with plans for ground magnetic studies and till sampling at Sarvilehto, and bedrock and soil sampling at Lauttaselkä. The Seuru project is in Lapland, the northernmost province of Finland. The project is road accessible and the area is serviced by two local towns, Kittila and Sodankylä. Part of the land package adjoins the east side of Agnico Eagle’s Kittilä Mine property, an underground gold mine and Europe's largest primary gold producer. Despite the long Iron and Manganese-ore exploration history of the area, the promising gold potential of the area is still not well explored. GTK performed geophysical surveys, till geochemistry, and drilling results in the Geological Survey of Finland (GTK) database indicate several target areas where structural intersections coincide with gold and trace element geochemical anomalies. The Lauttaselkä gold occurrence was studied by the Geological Survey of Finland (GTK) during 2006-2010. GTK drilled anomalous Au values from 0,4 ppm to 5,2 ppm from narrow shear zones and veins. 2018: FireFox completed compilation of historic GTK Data, performed limited percussion geochemical till sampling and collected surface grab and heavy mineral samples at the Selkä property. The Seuru Project is located within the Central Lapland Greenstone Belt (“CLGB”), a poorly-explored package of Paleoproterozoic-age mafic volcanic and sedimentary rocks which underwent three ductile compressional events around 1.79-1.92 Ga followed by one or more brittle stages. The Seuru Project is divided into two major parts and the bedrock of the entire reservation area comprises most of the stratigraphy of CLGB. The bedrock of the eastern part of Seuru reservation around the Lauttaselka target area is comprised of mafic volcanic rocks of the Kittilä suite (2.0 Ga), felsic-intermediate volcanic rocks of Salla group (2.5-2.4 Ga), mica schists of the Sodankylä group (<2.2 Ga) and the Savukoski group graphitic schists and ultramafic volcanics (<2.05 Ga). The geology at the Lauttaselka area is favourable for orogenic gold deposits: Several faults and shears cross-cut the mafic volcanic and mafic graphitic tuff units of the Kittilä suite. Agnico Eagle Kittilä Mine lies less than 10 km away. Bedrock in the Sarvilehto area consists of sulphide bearing rocks of Porkonen formation and mafic volcanites of Vesmajärvi and Kautoselkä formation. The most recent studies by Geological Survey of Finland (2009-2010) shows gold potential in the southern part of Porkonen formation which continues through the Sarvilehto target.